Hi, I'm Wil! I'm a cartoonist. I've been drawing ever since I was in preschool. I loved to draw Superman. I got in trouble many times for making large chalk murals at school. Then, I saw my first Peanuts book. I was hooked on comics, in all its forms forever. I grew up drawing. My dream job was to become either a famous comic book artist, or a newspaper comic strip artist, like my idol, Charles Schulz. I touched the sky once, back in 1994 when I took over as artist for a single panel comic called Chaos. It was syndicated by King Features. I was hooked. Sadly, the owner and writer of the strip decided to end its run without giving me a chance to take the reigns. I was devastated. My dreams were over, for now anyway. I decided to focus on my new career, in the video games industry. In 2010, I was laid off from my job and was forced to rethink my future. I decided to restart my pursuit of comic strip syndication, an easier road, I thought. I decided to draw from an old cartoon animation pitch I did for Hanna-Barbera. The characters of that pitch were Count Dracula and Frankenstein's monster. the premise was simple: Beloved monsters get laid off from Hollywood. What do they do now? What a coincidence! It clearly mirrors my situation. Tons of material! For years now, I've been drawing my comic strip in hopes of reaching that elusive dream, Syndication. Frank and Steinway began its run in Canadian papers around 2014. As you can imagine, I was absolutely ecstatic at reaching such a milestone. But I'm also very realistic in knowing that it still means a long hard climb up the mountain, usually for a small financial return. With the current state of newspapers today, that's become an even steeper climb. Creating a strip that is published both in the papers and online requires quite a lot of time. As for money, well, have you ever tried to pay for tools and living expenses with a cartoonist's salary? I've got tons of comic material on that. To keep my dream going, I've taken on a plethora of freelance work, on top of a full-time job. That leaves very little time to write draw and color my strips, much less sleep. Now, I know what you're thinking. What is a "plethora"? I don't know. It sounded important--but let's move on. As I've said earlier, I've come so far on my dream to give up now. That's where Patreon comes in. With Patreon, I've found a place where I can make art and tell stories I've always wanted to. With newspapers, I'm constricted with size and the typical readership tastes. Gag-a-day humor, and long story arcs if any are frowned upon. Honestly, I'd love to tell long stories, and not just with Frank and Steinway. With your patronage I hope to alleviate some and hopefully, all of the financial burdens that have come to impede my art creation. With less time to worry about expenses, I hope to fully concentrate on simply making great content. I would love for my page to become a destination point. With your help, I hope it will someday happen. As I mentioned earlier, I would like for my Patreon page to be a favorite destination place. With that, I'd like to showcase more of my skills. This includes my illustration skills, as well as my other comic strip ideas. All are available as prints and post cards for qualifying patron tiers! My many thanks for your support! My sincerest thanks and appreciation. I will make sure to keep the wellspring of Frank and Steinway and Grace flowing every month, drought be damned!! You'll have access to my activity stream, where I will post interesting musings on life, drawing, show spoilers (just kidding), whatever I think is interesting. You, as a patron can post as well! Ask a question, anything. Wish you were here, said the post card! My thanks of course! But along with the rewards mentioned in the lower tier, I will also send you a postcard featuring Frank and Steinway and all the principal characters. I will include a personal message of thanks on the postcard. I will also post the rough of the strip before final. You can also see the strip a day before it actually comes out! All the lower tier rewards, and you will have access to my blog about cartoons and other musings. 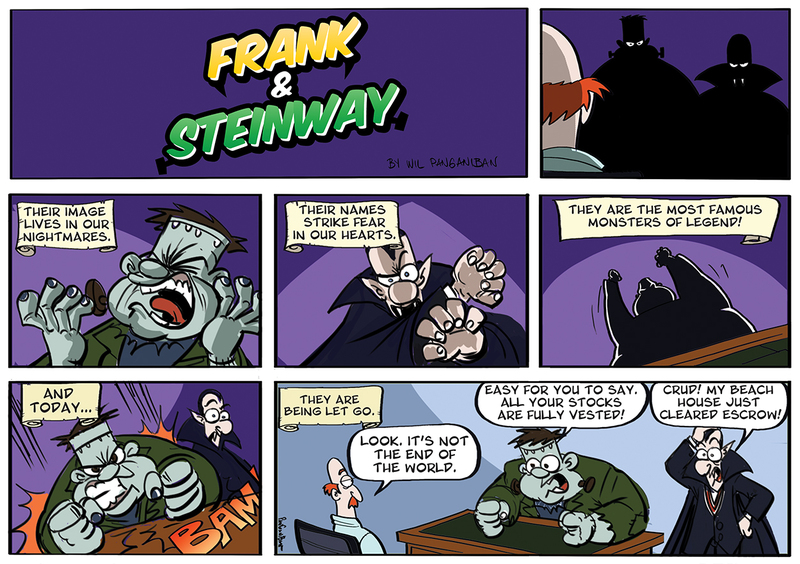 I will also send you a PDF version of Frank and Steinway's book! I'll also do a posts feature where I will choose 10 questions, or drawing requests from the posts I receive. I will then post those drawings, or answers in the activity center. I will also make high resolution pictures you can download for a wallpaper! The artist formerly known as Prints! All of the lower tier rewards, plus you will get a print copy of any new cartoon collection we create. I'll give you access to patron only videos. These videos will comprise of either tutorials, vlogs, live streams, or other behind the scenes extras. I will do 8 x 10 prints of art that I normally take to conventions with me. They vary in styles and content. Also, at the end of each month, you qualify for original art that I will raffle off to one lucky patron. This is the commission SKETCH tier. You can tell me what you'd like me to draw and I'll draw it. Please keep it classy. It will be a pencil drawning on nice bristol paper and mailed to you with my signature and thanks (of course)! Freelancer? I don't even know her! This is my discounted FREELANCE tier. Use this if you want a simple, professionally drawn inked piece, whatever it may be. Please keep in good taste. Get an original drawing of a superhero. You want a black and white comic strip? I'll draw one for you. (Limit to one drawing per month per donation). Have any more questions? Want a more elaborate drawing? Let's talk. Send me an email. Thanks. If we reach this goal, I hope to bring in some help. Extra time not color is extra time drawing! Hey, maybe some monthly prints! Original drawings?